The global AI in cyber security market is predicted to grow at 35.0% CAGR during the forecast period with the market size reaching USD 31.2 billion by 2024. Different technologies including natural language processing, machine learning, and image processing are majorly contributing to the AI in Cyber Security market size. 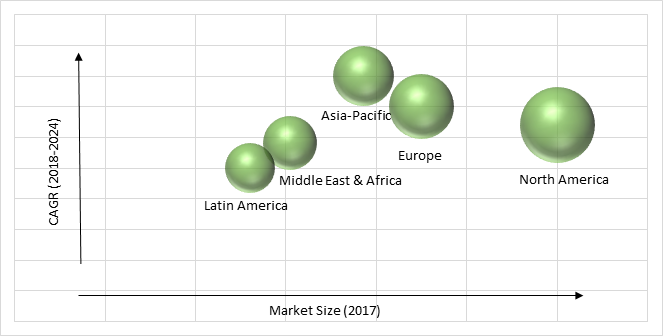 The market has witnessed significant demand for these technologies and services over the last few years due to increasing adoption of internet of things (IoT), vulnerability of systems connected to Wi-Fi networks, and increasing number of cyber-attacks. Based on technology, the AI in cyber security market is categorized into natural language processing, speech recognition, machine learning, and image processing, of which machine learning technology holds the largest share in the AI in cyber security market, globally. The machine learning technology offers rapid analysis, prediction and processing of data from unlimited number of sources and also helps in analyzing user behavior and interpret them, which makes it’s the most utilized technology for AI in cyber security market. On the basis of security type, the market is segmented into Identity and access security services, network security services, cloud security services, data security services, and others. Of all, the AI for cloud cyber security services is predicted to witness the fastest growth during the forecast period. The primary factors responsible for the fastest growth of AI in cyber security services market are the increasing number of or large enterprises using cloud platform for data repository and as servers, which makes it vulnerable to cyber-attacks. Based on application, the market is segmented into firewall, distributed denial of services, anomaly detection, web filtering, intrusion detection, and data loss prevention. The AI in cyber security market size is the largest for anomaly detection due to the increasing number of financial and banking frauds and mounting number of cyber-attacks. Different organizations especially banking and finance organizations require identification of any suspicious activities which might lead to possible fraud or cyber-attack, therefore they implement AI for cyber security to track any intrusion or fraud. The stringent data privacy regulations, increasing adoption of digital solutions, increasing number of cyber-attacks, and increasing inclination towards cloud-based solutions from on-premise are the key factors leading to the growth in the AI in cyber security market, globally. Cyber-attack is one of the biggest threats to the modern world. According to the World Economic Forum (WEF), the top five most likely events to happen in 2018 across the globe, from most to least likely are: extreme weather events, natural disasters, cyber-attacks, data fraud or theft and failure of climate-change mitigation and adaptation. The fact itself depicts the utmost need for security from cyber-attacks and data fraud. Therefore, with the increasing vulnerability of data bases to cyber-attacks result in the growth of AI in cyber security market. Key challenges faced by the AI in cyber security industry are limitation of security budget against cyber-attacks especially in developing and underdeveloped countries and inefficiency of AI to tackle cyber threats in advance. In addition, dearth of skilled AI and cyber security professionals for cyber threats is having a negative impact on the growth of the market. Geographically, North America is the largest AI in cybersecurity market as the number of mobile malware attacks are increasing in the country and increasing usage of connected devices in the region. Moreover, in the U.S., largenumber of industry players spend largesum of capital to tackle the cybersecurity threats. Asia-Pacific is observed to witness the fastest growth for AI solutions in cyber security during the forecast period. Different organizations including larges as well as small enterprises are adopting these technologies to ensure security from cyber-attacks. Market players in the AI in cybersecurity industry are investing capital to develop technologically advanced systems for anomaly detection, web filtering, intrusion detection, and data loss prevention among others. Check Point Software Technologies Ltd, Juniper Networks, Inc., Amazon, Inc., Intel Corporation, RSA Security LLC, Palo Alto Networks, Inc., Fortinet, Inc., IBM Corporation, Inc., FireEye, Inc., BAE Systems Plc, Cisco Systems Inc., and Symantec Corporation are some of the key players offering solutions and services for AI in cybersecurity. 11.6. Palo Alto Networks, Inc.
Table 191 Snapshot – Juniper Networks, Inc.
Table 194 Snapshot – Palo Alto Networks, Inc.
Table 195 Snapshot – Fortinet, Inc.
Table 197 Snapshot – FireEye, Inc.
Table 199 Snapshot – Cisco Systems Inc.